Magnet can now be forgiven for their putting bland prettyboy Pete Yorn on the cover last year. 2004 kicks off with the totally unmarketable but thorougly remarkable Soft Boy Robyn Hitchcock on the cover as part of their ‘Eccentrics and Dreamers’ feature. Also in this ish, the year in music 2003. Another Sassy New Band Alert! Trespassers William were brought to my attention by Sean Hotsauce, who gave me their cover of Ride’s “Vapour Trail” (soon to be an MP3 of the week – patience). This Californian outfit combines country and shoegaze influences into a lovely, spacey narcoleptic brew. Think equal parts Slowdive and Mojave 3, Mazzy Star, maybe some Cowboy Junkies… I just got their sophomore album, Different Stars, through CD Baby, where you can stream the entire record to preview. The band is making some headway in the UK right now and deservedly so. It’s really good stuff. Indie Rock Live has gotten a shiny new makeover, and has some new material up. Check out shows from Super Furry Animals, Azure Ray and Portastatic. They’ve also got shows in Bit Torrent format. I just discovered Bit Torrent. I am all about the Bit Torrent. Actually, I just like to say it. “Bit Torrent”. Say it with me, kids. “Bit Torrent”. Ahhh. If anyone in Toronto is used CD shopping in the next while and comes across what looks to be a near-complete set of Mark Kozelek/Red House Painters CDs, please drop me a line. A friend’s apartment was broken into this weekend and a pile of her CDs stolen. The RHP ones are the ones she really wants back. Thanks. Ever worry that you’re not quite a big enough geek? These DIY Imperial Stormtrooper props will take care of that in a jiffy. Guaranteed to get you disavowed by even your mother. The Jayhawks tonight! Looking forward to busting out the camera again, it’s been a while. Not looking forward to finding myself in the bitter cold at 1AM, far from home. But what can you do. I’m not going to talk too much about the Bloggies thing, though I registered well over 500 hits yesterday – that’s more than double my usual traffic, and today is already even busier. I’m was ranked #36 on the Blogdex this morning (though down to 53 now). Not to sound disingenuous, but I’m really taken by surprise by this whole thing. To this point, despite all my traffic trackers, I’ve never really thought about the fact that people read this thing. I mean, I know my friends and the modest network of other bloggers I link to visit, but the notion that there were many more visitors whom I’ve had no contact whatsoever with… it never really occurred to me. Now I feel like some guy who’s been goofing around on a dark stage playing AC/DC air guitar and singing “Highway To Hell” off-key, only to have the house lights turned on to reveal a packed audience. Uh, hi. So bear with me while I get over this hopefully-temporary bout of extreme self-consciousness. And if it sounds like this is going to my head, someone slap me. With a fish. Thanks to Five Seventeen for the title bout poster up above. I won’t ask why my shorts are hiked up quite so high. And finally, I’m not going to lobby, but I will say this – I don’t think Moby needs that $50 gift certificate for Amazon.com. I’ve added you to this week’s installment of the Carnival of the Canucks. Seeing as you were nominated, it would be foolish to leave you off the list. Congratulations and good luck on the weblog awards. That Trespassers William disc is great! I was turned onto them by KEXP, perhaps the greatest streaming radio station of all time. whoa, i made your blog! "No hitting below the belt", Frank. A better question is "why does Moby look like he needs to find a toilet?" I wonder if he’s even aware of the Bloggies, and if he is, is he checking out the competition? 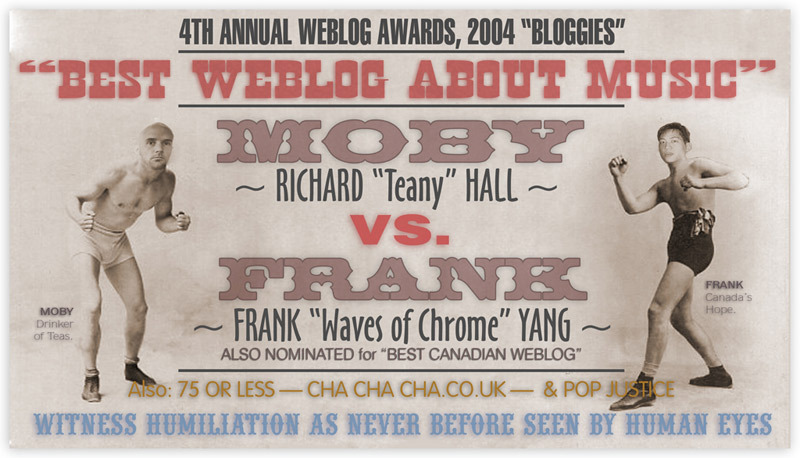 If so, this is to Moby: Can you please send Frank some tea (Earl Grey Crème) which he can give to me. mmmmm. And I hope he takes the poster in the right spirit. stop kissing up to the vegans, five! oh don’t worry Frank, you still have my vote… for now. BitTorrent is wonderful! Sharing The Groove has been sucking all my bandwidth for the past couple of months (in a good way). There are some excellent shows there, check out the Extra Glenns 2003 Austin performance. With mention of Extra Glenns I sought out this Bit Torrent thing. What do you use to download the files? What’s a good interface?